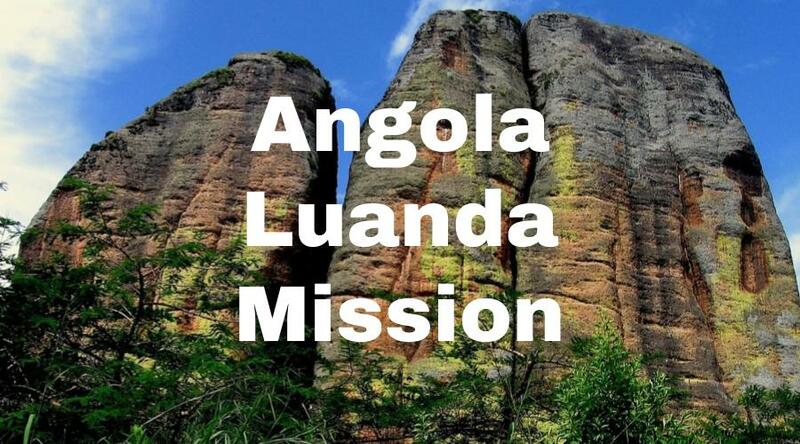 Here’s a recent address for the Angola Luanda Mission. We try to keep this information up to date, but it’s a good idea to check the mission address with several sources, including your mission packet or the mission office. Igreja de Jesus Cristo dos S.U.D. Here’s a list of LDS missionary blogs for the Luanda Mission. This blog list includes the missionary’s name, URL and when their mission blog was updated. Here are Luanda Mission Groups- for LDS missionary moms, returned missionaries, mission presidents and other alumni of the Luanda Mission. Here are T-shirts for the Angola Luanda Mission! 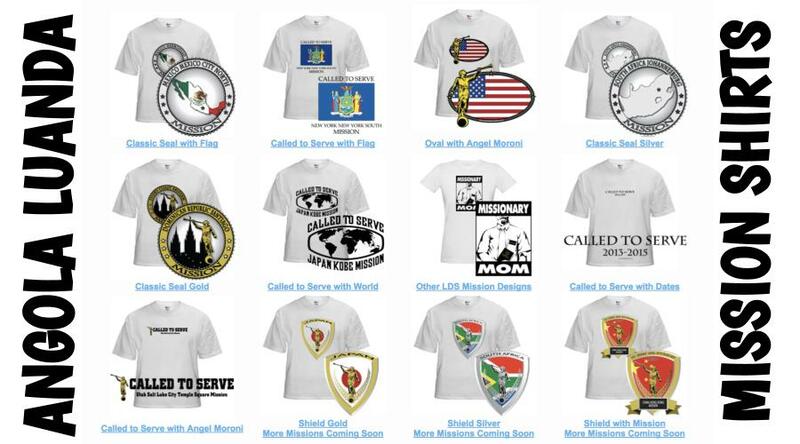 Shirt designs include Angola Luanda Mission logo/emblem shirts and Called to Serve shirts. The shirts make great gifts for pre-missionaries, returned missionaries and missionaries currently serving. LDS Mission shirts come in all sizes: Small, Medium, Large, Extra Large, up to 4XL. The mission designs are printed on white shirts and are shipped to you. *Simply click on a shirt design to view the details and submit an order. The designs on mission t-shirts may also be printed on other LDS mission gifts, including: Angola Luanda missionary aprons, Christmas stockings, ties, pillow cases, teddy bears and Christmas ornaments. Here’s a list of current and past Mission Presidents of the Luanda LDS Mission. Here are survey responses from Angola Luanda RMs, to give you a snapshot into what it’s like to live in the mission. What are some interesting facts about the Luanda Mission? Any advice/testimony for pre-missionaries going to Angola? When I was called to the mission in 2012, Angola was part of the Mozambique Maputo Mission. Then in July 1st, 2013, while I was serving there, the Angola Luanda mission was created, including the whole country of Angola and the Island of Sao Tome. When I was in Angola, there were between 30 and 40 missionaries. Angola’s capital city of Luanda has a district, so there isn’t a stake yet in the country. There are about five branches in the district, but almost all of them are the same size as a ward, they just need more units to form a stake. Outside of Luanda there are two other cities that have church units; one is Huambo and the other is Lubango. Each city has one branch, and the Huambo branch was created about a month before the Angola mission. The leadership of the church in Angola are members who were baptized in Portugal or Brazil who moved to Angola. That is mainly how the church there began. I know that Angola got independence from Portugal in 1875, but after that, there was a civil war in Angola. The leaders of the two political parties got in a fight, and that is what caused the civil war, which lasted 30 or 40 years. During the civil war, tons of people fled to Luanda, because it was a safe zone. Because of that, Luanda was really unorganized and the population there grew over night. First of, Luanda has a lot of dirt, which means that you have to wash your hands and face a lot. I miss getting home at the end of the day and washing my hands and seeing all of the dirt going into the sink. There is a lot of dirt in the air. Malaria is real, so we are supposed to take Malaria prevention pills every day. I know a missionary that got Malaria and he never missed a day of those pills ever again. There is another disease called Dengue fever. The Malaria pills don’t prevent it, but they do help tone it down. I got it once and I was down for three days, and I was taking my pills. Be smart, take the pills, and use mosquito repellent. In terms of crime and safety, at night it gets kind of sketchy in the city. You have to make sure you are in lighted areas. Have some money with you in case you need to bribe a robber. Taxis make it easy for people to pickpocket. Cover your pockets at all times and make sure no one is scooting too close to you. I got pick-pocketed once, but I only lost $10 so it wasn’t a big deal. Every once in a while, missionaries will get stopped by robbers with knives or guns. I was stopped once by four robbers with a gun. You just have to give them what they want and you are fine. There was a missionary who didn’t do that and he was actually stabbed. He ended up being fine, but it’s best to avoid that completely. When I was getting robbed, I wasn’t worried at all, I knew it would turn out fine. It’s a very accepting culture. The people are really friendly. Usually the houses have one yard that connects five or six house. Basically those houses become family, even if they aren’t related. They borrow things from one another and their kids play together.